For some coffee is a necessity. For others an obsession. For the users of the Aeropress, it appears to be a necessary obsession. The Aeropress, which has been around since 2006, has been the caffeine-delivery darling of coffee enthusiasts and the techie set, a sort of daily double under the category of geeks. There are videos, blogs, and worldwide Aeropress championships devoted to coffee-brewing innovations. The darn thing has its own official app that tells you when to steep, press, and pour. Even the guys from the MythBusters Tested studio confirm the Aeropress's supremacy. So while those in the know touted it as the best, I had never seen one, let alone drank of its apparent coffee perfection. Could it live up to the hype? American inventor and Stanford engineer Alan Adler created the Aeropress after more than a year of tinkering. His previous inventions included the Aerobie Pro Flying Ring, a cousin to the Frisbee, which broke a world record for distance throw. Unsatisfied with the way coffee tasted when he brewed it at home Adler set out to find a new method. He identified four variables that impact coffee's flavor: time, temperature, the grind of the coffee, and grit - the stuff in your cup - and set out to invent a machine where those factors could harmonize like the Ink Spots. The Aeropress is hilariously simple: a hard plastic tube with a filter cap that screws onto one end, and a plunger with a rubber stopper. The basic kit also includes a stirrer, a scoop and a year's worth of paper filters. There is also a funnel to get coffee grounds into the tube but it's not essential unless you are suffering from profound coffee jitters. I made my first Aeropress cup with several scoops of skepticism, carefully following the exacting instructions. While the water boiled, I wet a filter, placed it in the filter head and screwed that onto the bottom of the tube. I dumped two scoops of Whole Foods Celebration Blend (a wussy choice, I know, but I yearned for those apricot and toffee notes) into the tube. Then I filled my coffee cup with just-boiled water. This served two purposes: It heated the cup, and cooled the water to the prescribed 185 degrees. I then poured some water from the cup over the coffee grounds and stirred to ensure they were completely wet. I then filled the BPA-free tube with the rest of the water, inserted the plunger, placed it over my now empty cup and ever-so-gently pressed down. As the plunger came close to the coffee - now a compacted puck of grounds - a satisfying hiss of air escaped. Coffee was seconds away. At the end of my press, my cup was filled with an intense, espresso-style liquid (real espresso is made with steam). The first taste was intense - too intense for my delicate, ladylike sensibilities - but with a pure coffee flavor that could hold its own against any elitist espresso. I decided to top mine with some water for an Americano-style coffee. I warily took my first sip. Was it perfect? But by the third cup, once I'd gotten into the groove, I had myself one great cup of coffee (Yes, I'm talking to you, Witness fans). A shorter brew time in water that's not as hot as that in a conventional drip coffee maker means a less acidic brew. And that means less time (none in fact) for me hunched over my desk with a sour stomach an hour later, which is my experience with regular drip coffee. A confirmed latte drinker, I was able to use half the milk I usually do with the Aeropress brew. The coffee is so smooth you don't need milk to mask harsh flavors. The only mistake in my many trials was to use boiling water straight from the kettle - I found it hard to believe water temperature made such a difference, but I was wrong. The high temperature resulted in a bitter, angry little cup of coffee that went down the drain. This gadget's similarities to the French press are notable, but as the water has less time to mingle with the coffee, it avoids the oiliness and bitterness of a French press, and no grit found its way into my cup. As soon as I was done with the official testing phase of the Aeropress, I took a more relaxed approach to using it - no temperature testing, no precise water measuring. Sometimes, I didn't even use freshly ground coffee! (Please don't tell Mr. Adler.) I wanted to make coffee the way a normal, lazy person makes it. The results were not consistent, flavor-wise, but each cup was still smooth and easy to drink. Clean-up is simple. Green-minded people reuse the filters five or six times. I just unscrewed the cap that holds the filter, and used the plunger to gleefully shoot the puck of compressed coffee into the garbage. A quick rinse of the plunger, and done. The whole event, from kettle boiling to puck-shooting takes less time than it does to brew a pot of coffee. The Aeropress is an ideal gift for control-freaks, scientists, and tinkerers. It's perfect for the office if your boss is too cheap to buy decent coffee; it's ideal for lonely freelancers for whom brewing a big pot is a waste of cash. And survivalists and end-of-days types take note: No electricity is needed (just build a fire to boil water! ), so it's ideal should you need you need a quick cup before the rapture occurs. I now find myself pondering coffee bean varietals as others mull over wine grapes. Caramel notes, burnt marshmallow undertones, hints of smoke, and dark chocolate have become more than just hyperbolic copy written by hopped-up Whole Foods employees. 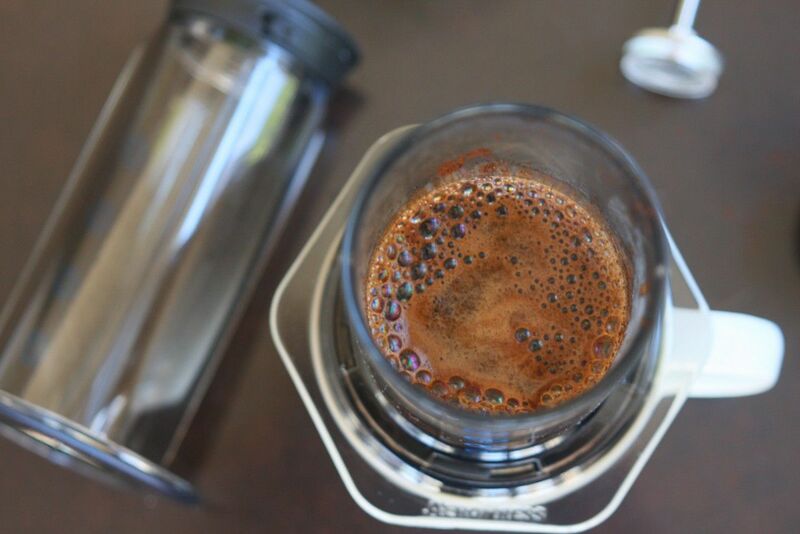 The Aeropress's method of brewing makes the flavors sing like no other coffee maker I've used.